So many of my brides love beach photography, so I love when the sky cooperates at one of my favorite wedding locations, the beautiful Ritz Carlton Laguna Niguel. This rare sky took place after a stormy night which threatened to move this couple's wedding indoors. Thankfully, the rain went away and left a beautiful sky for us to play with, as well as a sunny day for this bride and groom's outdoor Hindu wedding. For this photo, I had the groom twirl his beautiful bride around, taking care to ask her to smile at me each time she turned. Eventually, she got to the point where I had spun her so many times that she just about passed out, but the resulting image ended up being one of their favorites. Off-camera lighting added to the stunning drama of this image. This couple actually had a morning ceremony with a luncheon reception, so we created this portrait after the guests had left. 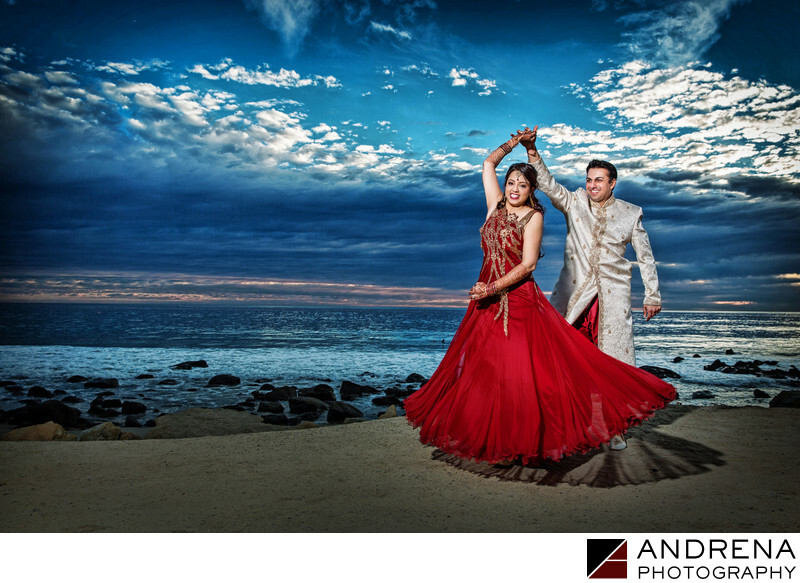 This gave us ample time to create beautiful images at just the right time of day. All too often, my clients hope for a sunset yet only have time for portraits at noon. It is always so nice when the timing of a couple's portraits coincides perfectly with the timing of a sunset, and it's even better when a sunset is actually visible (rather than marine layer or fog). I was privileged to photograph the groom's sister's wedding many years prior, and always feel so happy when a family loved my work so much that they call me for a second sibling's wedding.